We are passionate about UX and strongly believe that large organisations should build their own UX capability in-house. Finding experienced UX people is challenging so why not consider skilling up your existing team. Our experienced Principal and UX Manager offer a range of UX coaching services to help you build your own UX capability in-house. If you want to build up your organisation’s UX capability in-house you can go and recruit experienced UX professionals but often these people are in high demand. Good UX people can be difficult to find and attract, especially if you don’t know what to look for. An alternative is to build your team’s UX capabilities through in-house training and UX coaching. Our UX coaching services can be provided by teleconference or online meeting or in person on site on an hourly or daily basis. Our UX coaching services are conducted by Tania Lang (Principal), who started doing UX work in 1999 or David Humphreys (Manager), who has been at PeakXD since 2007. Both Tania and David have extensive UX industry experience. See Our team for more information about our mentors. today to discuss how we can help your organisation build a UX capability. 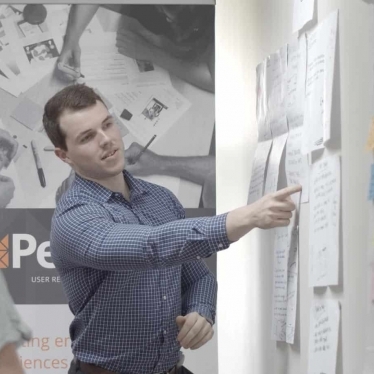 "Peak have actually stayed on to help MS Queensland in a mentoring capacity. It's really been useful just to keep UX framework front of mind for us because I think sometimes what happens is that you leave a course and you just slip right back into the way things have been done in the past. But having that mentoring and that ability just to pick up the phone or have someone from Peak run a session to educate all of our staff - it's just meant that we've stayed true to that principle of really building things with our customers front of mind." "Very practical skills I can take back to improve our business and provide better services to users." "The journey of discovering a process for designing with the user as the priority was enlightening. It makes so much sense to this in this way, and these tools are so valuable to me"